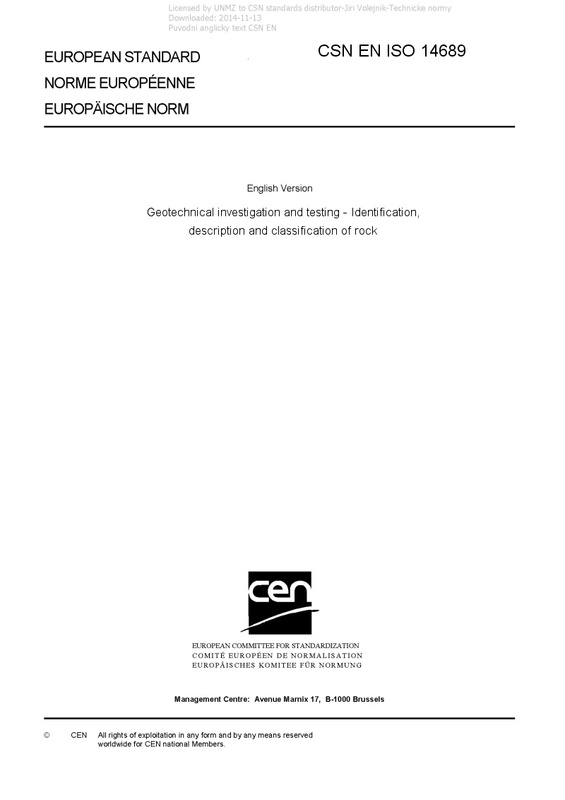 EN ISO 14689 Geotechnical investigation and testing - Identification, description and classification of rock - ISO 14689:2017 specifies the rules for the identification and description of rock material and mass on the basis of mineralogical composition, genetic aspects, structure, grain size, discontinuities and other parameters. It also provides rules for the description of other characteristics as well as for their designation. ISO 14689:2017 applies to the description of rock for geotechnics and engineering geology in civil engineering. The description is carried out on cores and other samples of rock and on exposures of rock masses. Rock mass classification systems using one or more descriptive parameters to suggest likely rock mass behaviour are beyond the scope of this document (see Bibliography). NOTE Identification and classification of soil for engineering purposes are covered in ISO 14688-1 and ISO 14688-2. Identification and description of materials intermediate between soil and rock are carried out using the procedures in ISO 14688-1, ISO 14688-2 and this document, as appropriate.